By David Ponce on 11/14/13 • Leave a comment! Bought a shiny new 3D printer but you’re still looking for stuff to print? Maybe CAD modelling just isn’t for you and everything you’ve tried to create so far looks kind of wonky. 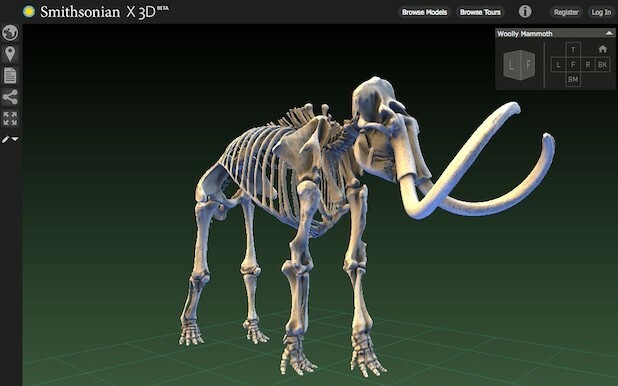 Well, the Smithsonian has launched a collection of 3D files that let you explore the various models in detail, directly in your browser, as well as print them at home in that printer of yours. Items include a woolly mammoth skeleton, as well as Amelia Earheart’s flight suit and the 1903 Wright Flyer. The effort is called Smithsonian X 3D, and its launch coincides with a two-day conference of the same name that started yesterday.